Nescafé's high-end brand Dolce Gusto launched the Yunnan Espresso Limited Edition to the Chinese market on September 22. Made with raw materials from local coffee plantations in Yunnan Province, the Yunnan Espresso Limited Edition is now available in 70 countries and regions across the global market. The brand new product is an elegant type of Arabica coffee, featuring a unique and delicate sweet and sour flavor. The coffee's enchanting smell spreads light flower fragrances that fulfill the aspiration for a fruity palate, and its exquisite and rich texture and after taste bring a smooth finish. The packaging adopts a brushed metal material, the pattern of which is inspired by traditional Chinese ink paintings. The design of the product's logo utilizes China's traditional stamp culture. The Yunnan Espresso Limited Edition is designed to create an impressive drinking experience. 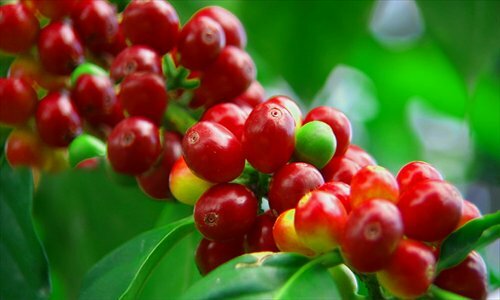 This is the result of hard-working Yunnan coffee farmers and the local agronomists of Nestlé. It is their constant efforts in upgrading planting technology, coffee bean quality and insisting on sustainable growth habits, that yield such supreme coffee products. During the 2014-2015 purchase season, Nestlé's Puer agriculture service department in Yunnan Province received a special task from the company's Switzerland-based purchasing headquarter. The center was asked to look for a batch of superior quality coffee beans for Nescafé's Dolce Gusto Yunnan Espresso Limited Edition. Based on coffee supply records in the past years, Nestlé implemented quality tracing to evaluate the quality of various beans. Over ten plantation's products were chosen. Under the suggestion and guidance of Nestlé agronomists, coffee farmers carefully selected the best fresh coffee fruits and carried out quality control throughout the entire processing procedure including peeling, degumming, soaking, drying, decladding, grading and screening. Finally, seven suppliers stood out; two from Xishuangbanna and five from Puer in Yunnan Province. An innovative technology designed to bring a brand-new coffee experience to consumers, Nescafé's Dolce Gusto capsule coffee machine has become well known and received by Chinese consumers since it entered Chinese market in 2013. Now Dolce Gusto has become a symbol of a fashionable urban lifestyle in China. At present Dolce Gusto has set up 29 offline shops and counters in Beijing, Shanghai, Hangzhou in Zhejiang Province and Shenzhen in Guangdong Province. Their products are also available on online stores such as T-mall and JD.com.